It has been a while since I asked someone to do a guest post on The Project Corner, but here we go again. I asked my twitter buddy Michael Belfry (@MichaelBelfry) to write a post about the WBS. The WBS, or Work Breakdown Structure, has been mentioned before on the blog in my 5 incorrect way’s to use MS Project series. But I believe it could go with an upgrade and some more information for you, the readers. Michael is a trainer in Microsoft Project and also has a blog, and even creates stunning and professional video’s to support his posts that are available from his YouTube channel. He even created a specific video for this post to give everyone a clear view on the subject. A work breakdown structure, or WBS, is a key deliverable that organizes a team’s work into manageable sections. Using hierarchy, you can group the various tasks in your project into sections or phases to make the entire process easier to manage. Here is how hierarchy is used to represent the structure of this project. Task 0, Technology Conference represents the entire project. This is useful because, at a glance, we can tell that the project will take 47 days to complete. 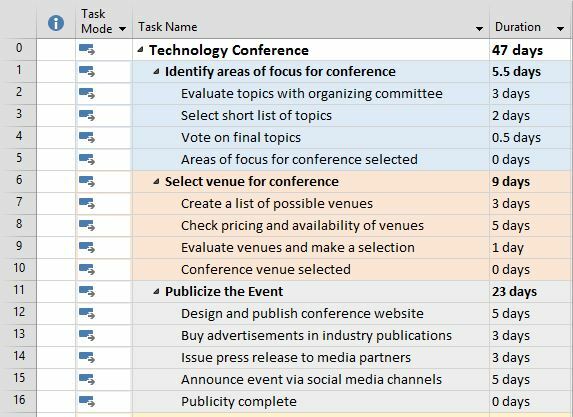 Task 1, Identify areas of focus for conference is a summary task that represents one phase in the project. This section of the project will take 5.5 days to complete. Tasks 2 – 5 (Evaluate topics, Select short list, etc.) represent the detailed steps necessary to complete the work in this phase. Once complete, the conference organizers will have a list of topics they’d like to focus on. Using hierarchy in this manner provides several benefits. The task list is easier to understand. We can instantly tell that Publicize the event is a separate part of the project from Select venue for conference. While I used color to make each phase in the project easier to discern, hierarchy alone would have done an adequate job. You can manipulate the outline. Once you’ve configured a work breakdown structure in Microsoft Project, it becomes interactive. By clicking the triangles next to any of the project’s summary tasks, you can collapse that part of the schedule. This simplifies the task list and lets your team focus on whichever phase is most relevant at the time. Clicking the triangles a second time expands that part of the task list and reveals tasks that were previously hidden. It simplifies delegation. As the project manager, you can easily make another member of the project team responsible for any part of the project. 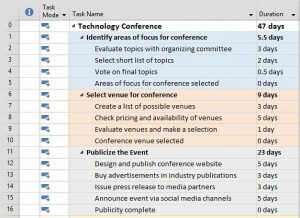 “Selecting a venue for the conference” (tasks 6 – 10), for example. Setting up a work breakdown structure in Microsoft Project involves a few basic steps. Assuming you’ve entered all of the tasks in your project, the first thing you usually do is turn on the project summary task. The project summary task represents your entire project in the WBS. Make sure a project name has been entered in the advanced properties dialog box. Click the File tab and verify the Info section is selected. Click the Project Information drop-down menu and select Advanced Properties. In the Properties dialog box, type a name for your project in the Title box. Turn the Project Summary Task on. Select Project Summary Task in the Gantt Chart Tools > Format > Show / Hide group. Indenting (and outdenting) tasks lets you build the hierarchy that will logically associate the project phases. Drag to select the tasks that will represent the various work packages in a project phase. Click Indent Task in the Task > Schedule group. For a look at all of the tasks involved in building a work breakdown structure in Microsoft Project, check out our video! In basic terms, a WBS lets you break an otherwise complex series of tasks into manageable chunks. Using hierarchy, you organize tasks into phases making the entire schedule easier to manage and update. Michael Belfry is a training consultant working in Canada and writes articles and tutorials at www.onsite-training.com. Hi readers, here’s Erik again. I hope you enjoyed reading about the Work Breakdown Structure as much as I enjoyed working together with Michael on getting the post up and running. 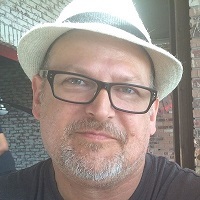 If you would like to know more about Michael make sure to add him on Twitter @MichaelBelfry and visit his site. I would not be surprised if we see more good content coming from him in the future, he has told me about some interesting things to come. As I hinted in the intro, there are more guest posts on the blog. Bonnie Biafore did a nice piece on Multiple baselines and Nenad Trajkovski told us about hard constraints vs deadlines.